I am very excited to announce that the IBPA – Independent Book Publishers Association – has just announced their finalists for this year’s Benjamin Franklin Awards which included Battlefield Earth. Battlefield Earth was originally published in 1982, hitting dozens of bestseller lists including a two-month-run on the New York Times bestseller list. At the time, famed artist, Frank Frazetta was commissioned by L. Ron Hubbard to propose his vision for what was then called, “Man: The Endangered Species,” the working title for the novel. 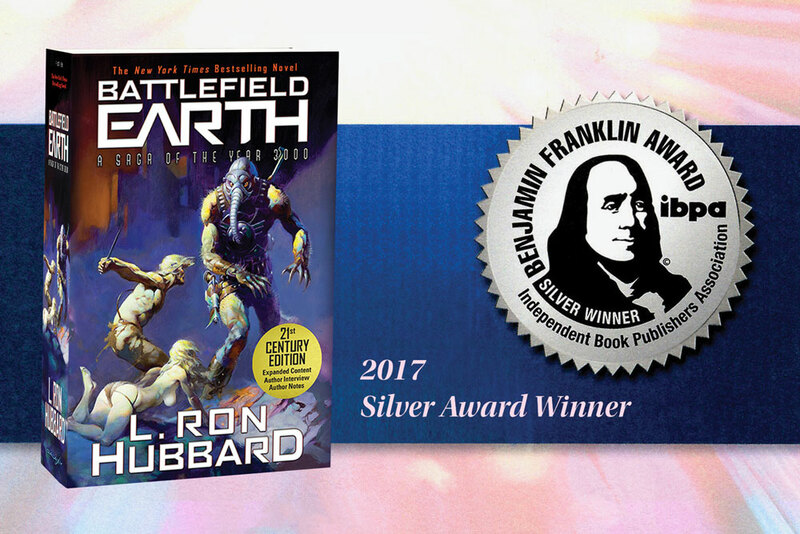 Battlefield Earth was recently republished as a trade paperback with a new design featuring Frazetta’s artwork and so became eligible for the Benjamin Franklin Award in the “Most Improved Redesign” category. While it is already guaranteed status as a Silver award winner, it remains eligible for the Gold Award which will be announced at a gala dinner being held at the historic Benson Hotel in Portland, Oregon on April 7. As a sidebar, our science fiction anthology L. Ron Hubbard Presents Writers of the Future Volume 31 was a Silver award winner for last year’s Benjamin Franklin Awards in the “Science Fiction & Fantasy” category.